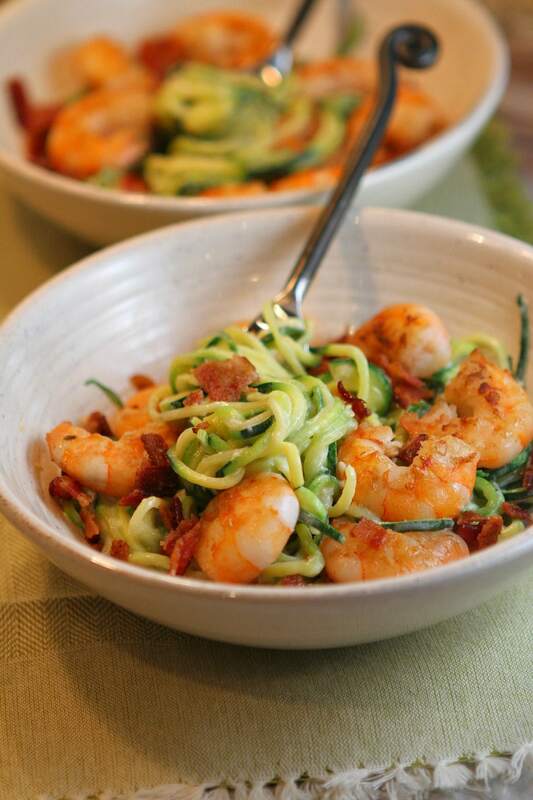 Alfredo Zoodles with Shrimp and Bacon is a dinner to make with your fresh zucchini! I guess I shouldn’t assume that you’re already familiar with zoodles. Are you? 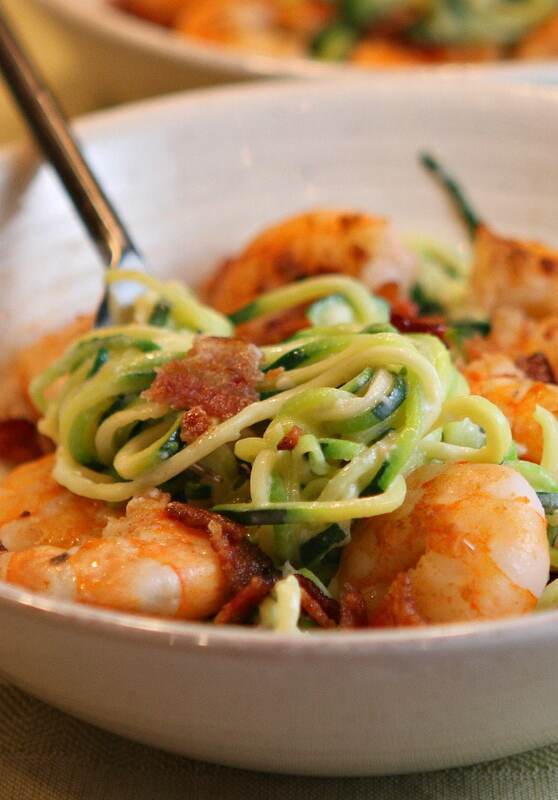 Zoodles = Zucchini Noodles. Yep, zucchini can easily be turned into noodles and attempt to mask the idea that you’re eating vegetables instead of pasta. The whole concept works for me, and I think it’s quite brilliant. I have eaten far too much pasta in my lifetime. That was fine in my younger years, but not so much for my older self. My body latches onto pasta like a leech, leaving behind bulges in places that I never, ever wanted. I do love my pasta, but I must limit it nowadays and use zoodles as a satisfactory replacement. How do you make Zoodles? You will need one of these to make Alfredo Zoodles. 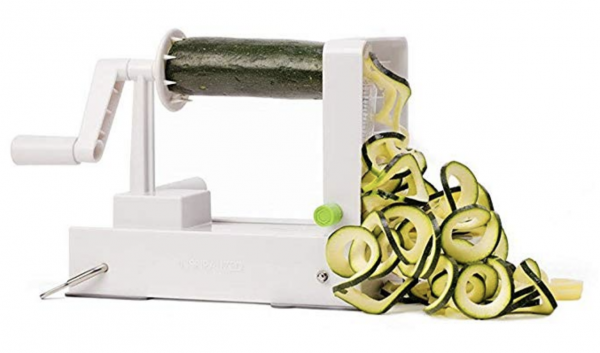 It’s a simple machine that turns your zucchini into noodles- a spiralizer. I have the Inspiralizer (sold on Amazon), and it works great. All you do is cut off the ends of the zucchini and place it in between the turning wheel and the blade. Then you turn the wheel manually and the zucchini is spiralized into noodles. It’s a pretty cool little gadget! You can use it for other veggies too… but I pretty much just use if for my zucchini noodles. 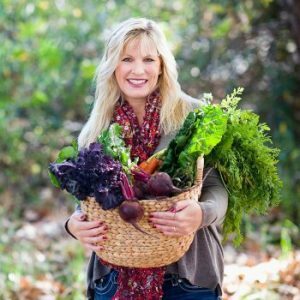 Can you buy zoodles at the store? Nowadays you can locate zoodles in the produce section of some stores. I haven’t had very good luck with buying and making already-spiralized zoodles. They aren’t very fresh. Your recipe will turn out so much better if you spiralize them just before cooking. 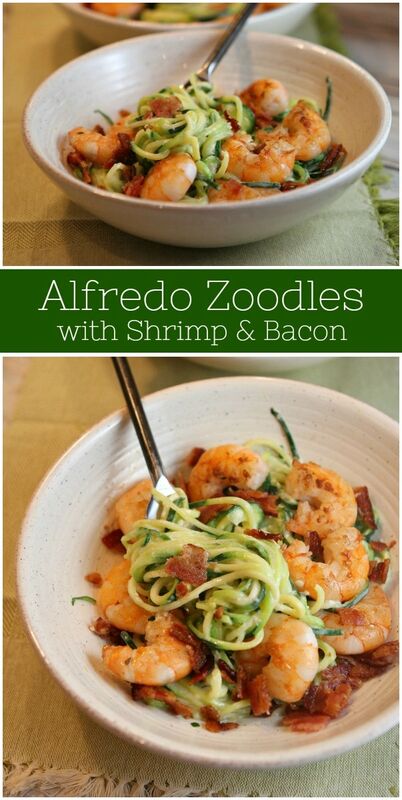 This Alfredo Zoodles recipe combines so many of my favorite things! 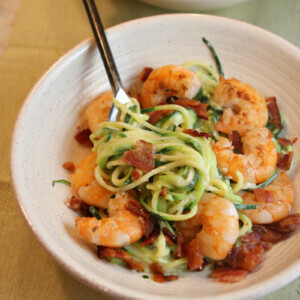 The zoodles are coated with a lighter alfredo sauce, the shrimp are sauteed in a little bit of butter, and it’s all finished off with some cooked bacon too. This recipe is Weight Watchers friendly, but you’ll have to count 10 points for your serving. I know that’s a lot, but Alfredo sauce (even lightened up) can be pretty caloric. I eat zoodles quite a bit but I just have one more recipe for them on my site: Pesto Spaghetti Zoodles with Heirloom Tomatoes. That recipe is good too! Can you substitute pasta for the zoodles? Sure! 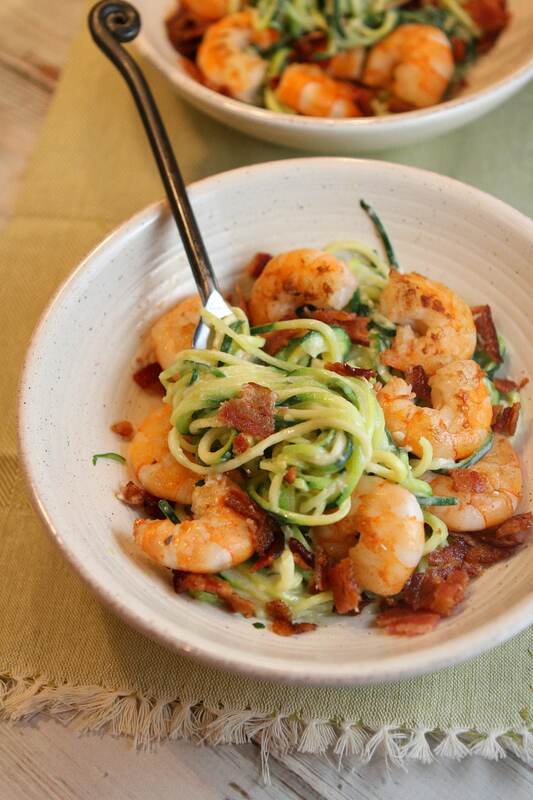 If you’re not into zoodles, just combine the sauce and shrimp and bacon with your favorite freshly cooked pasta. The easiest way to buy shrimp for recipes is to buy it frozen. When it’s frozen, it has already been cleaned and de-veined. If you buy it fresh (totally okay too), you’ll need to clean, de-vein and pat-dry with paper towels. To thaw frozen shrimp, let it thaw in your refrigerator overnight. If it’s not quite thawed out, you can submerge it in water for 10 minutes and then drain thoroughly. 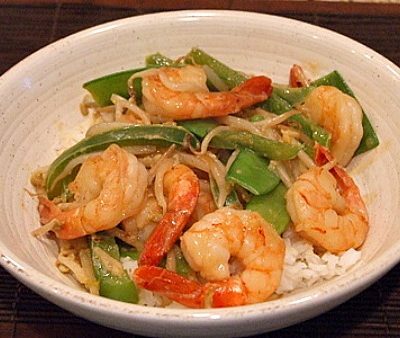 Do not let shrimp soak in water for a long period of time to defrost. You’ll end up with some pretty unappetizing, soggy shrimp! This recipe calls for four slices of cooked bacon. You can certainly fry those up in a skillet. I prefer to make bacon in the oven, and I make more than I need and keep the leftovers in the fridge for salads. To make bacon in the oven, preheat your oven to 400 degrees F, and line a large baking sheet with foil. Lay the bacon in a single layer onto your prepared baking sheet, making sure not to overlap. Bake to desired crispness, 15 to 25 minutes. 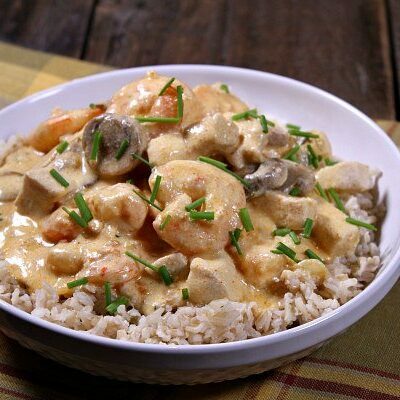 If you’re looking for more alfredo-themed recipes, you might also enjoy my Chicken Alfredo or The Best Alfredo Sauce Recipe. And if you were hoping to find shrimp recipes with real noodles, try my Rotini with Shrimp or this Angel Hair Pasta with Shrimp, Asparagus and Basil. 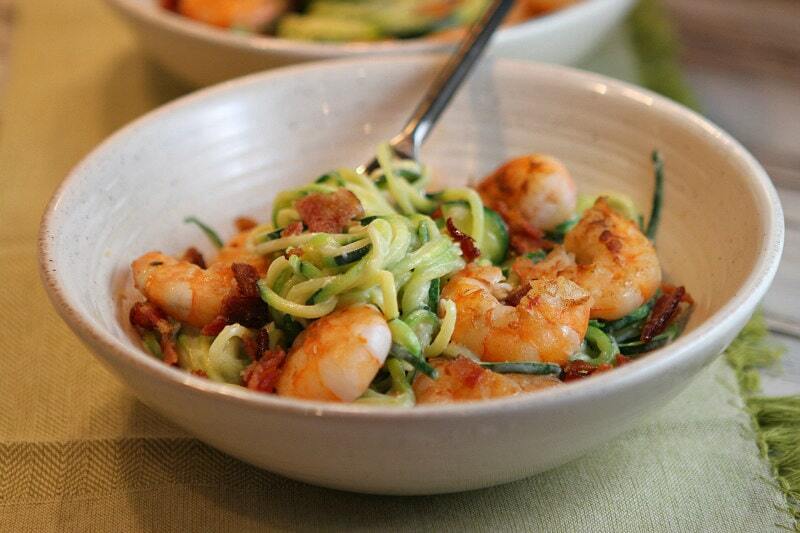 A delicious way to eat your zoodles! In a medium saucepan, melt the butter over medium-high heat. Add the garlic and cook for 1 minute until fragrant. Whisk in the zest and flour, then whisk in the milk. Whisk and stir for 4 minutes. Add the cheeses and continue to whisk and cook until melted and slightly thickened. Remove from heat and set aside. In a medium nonstick skillet, melt the butter over medium-high heat. Add the garlic and cook for 1 minute until fragrant. Add the shrimp and a sprinkle of salt and pepper. Saute until shrimp is pink and cooked through. Remove the shrimp from the pan and set aside. Add the spiral zucchini noodles (zoodles) to the skillet and cook over medium heat for just a couple of minutes- until the zucchini is slightly wilted. You don't want to cook them too much or they'll get watery and mushy. Add the alfredo sauce to the skillet and toss to combine with the zoodles. Divide the zoodles between three bowls. 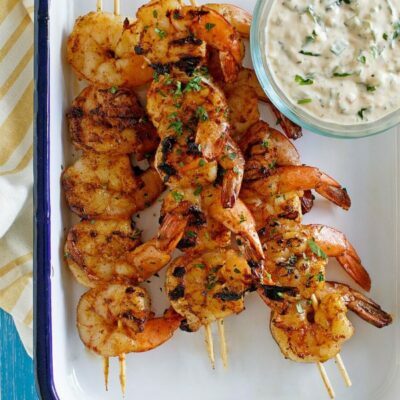 Top with shrimp and sprinkle with bacon and parsley (if using). Add salt and pepper, as desired. Serve immediately. There are Amazon affiliate links included within this post. What is the calorie count for the Shrimp with Alfredo sauce? I’ve just updated this information for you! Great minds think alike! i just posted a recipe last week with zucchini (although, I didn’t call them “Zoodles”). Everyone’s trying to use up their zucchini, I really like the way you took a traditional concept and made it healthier! I used ham, to get a lower cal number (my husband is on a diet) and used olive oil for the shrimps (and not butter). Could you possibly suggest a brand for the spiralizer? Mine is not that fancy. I am going to try this! Perfect for summer time. Thanks for sharing! Yum! I love shrimp alfredo. This sounds even better with bacon and zucchini! I can’t wait to try it. 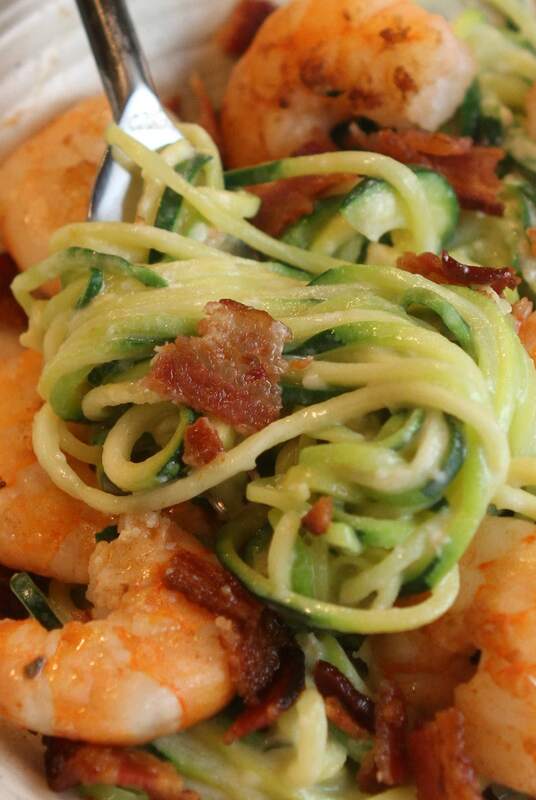 This might be the way that I can get my kiddos to eat zoodles…bacon and alfredo! I am TOTALLY trying this one. Thanks for the link up too! !